Sky - NEW!! Couture CZ wedding bracelet - Amazingly priced!!! HOME / BRIDAL JEWELRY / Wedding Bracelets / Sky - NEW!! 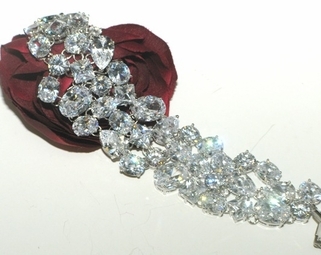 Couture CZ wedding bracelet - Amazingly priced!!! Description: Dazzling couture stunning CZ bridal bracelet, an amazing design for a glamorous woman. measures approximately 1 1/4" wide 7" long fits average wrist size.